A CUB SCOUT GIVES GOODWILL was the official Cub Scout theme in December 2003. The following information is from the 2003 Great Salt Lake Utah Council PowWow book. 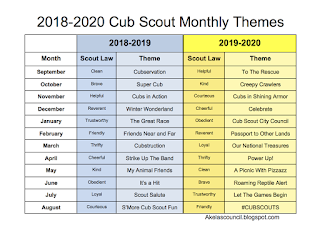 This is a great theme, and many of the ideas that were used back then can still be used today. 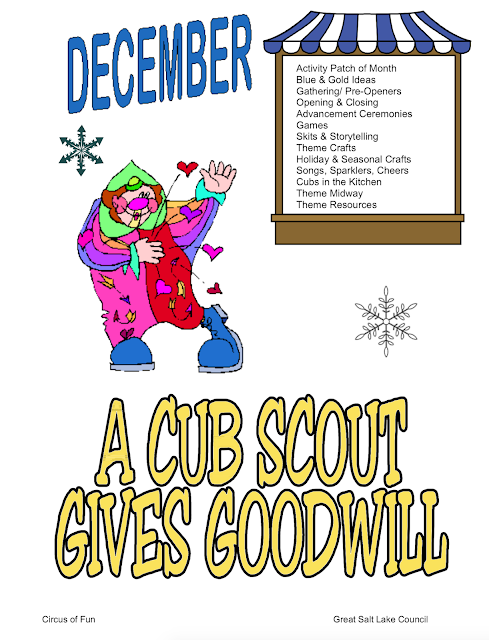 Guest speakers tell about their favorite gifts and why they were special. Who is Santa's favorite insect? Who helps Santa deliver toys when the elves are on vacation? Why doesn't Santa Claus like to shave? Why was Santa late on Christmas Eve? What do you get if Santa comes down the chimney when the fire is burning? What's in December that we don't have in other months? 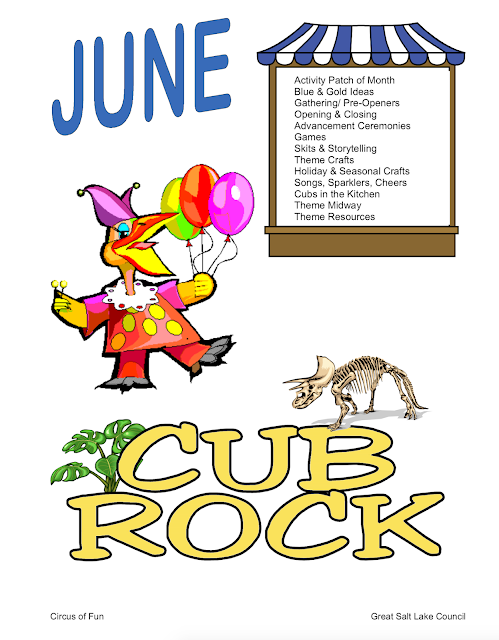 CUB ROCK was the official Cub Scout theme in June 2004. The following information is from the 2003 Great Salt Lake Utah Council PowWow book. This is a great theme, and many of the ideas that were used back then can still be used today. Why are some dinosaurs big and scaly? Why don't they let dinosaurs drive cars? What was the fastest dinosaur called? What do you do with a green dinosaur? What do dinosaurs have that no one else has? What do you have if a dinosaur walks through a potato field? What Fossils can you find? 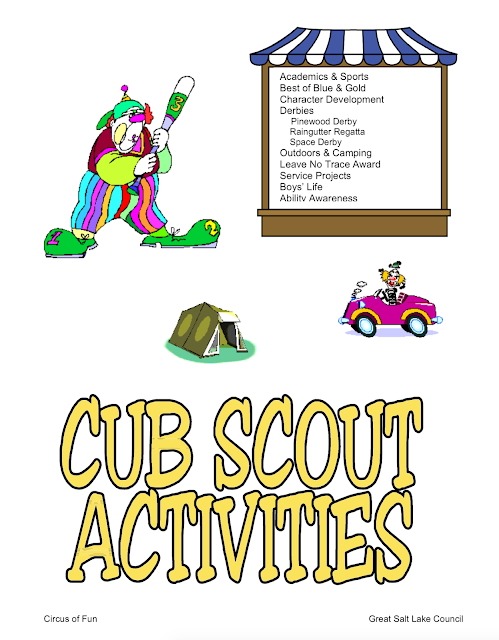 CUB SCOUT ACTIVITIES was a bonus section in the the 2003 Great Salt Lake Utah Council PowWow book. This is a great section, and many of the ideas that were used back then can still be used today. Why do we have a Blue & Gold every year? Why do we have it in February? How do I put it together and make it successful? I came again when days were past: That bit of clay was hard at last. You come again when days are gone: It is a man you look upon. And you could change him never more. You are dealing with a boy Who must be guided unaware: Must be shown, but oh so gently How to live both true and fair. Pins and badges aren’t our aim. Character building is our goal. But not to lose your courage now, For you are piloting a soul. 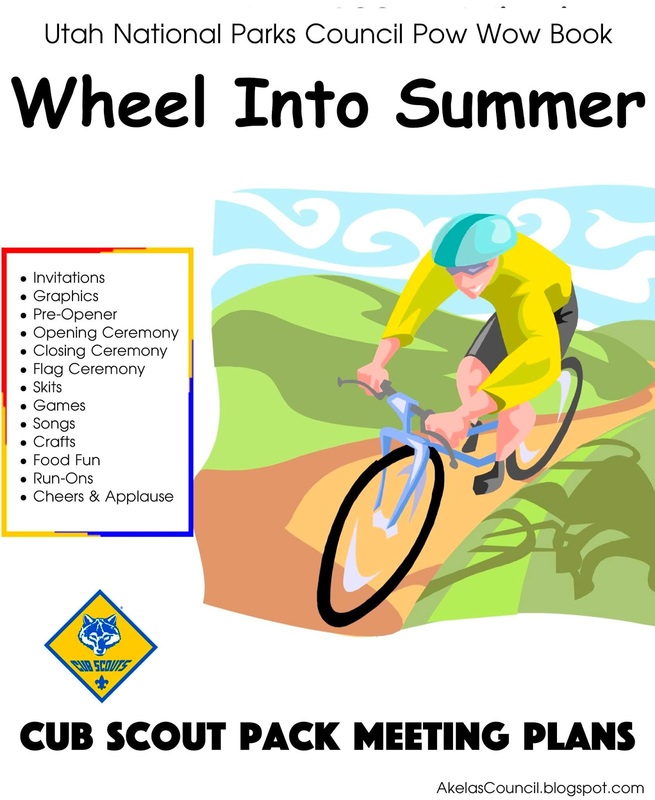 Cub Scouts "at Your Service"
WHEEL INTO SUMMER was the official Cub Scout theme in June 2007. Here is a section from the 2006-07 Utah National Parks Council PowWow book. This is a great theme, and many of the ideas that were used back then can still be used today. Is this water healthy for swimming? What can be served but never eaten? What do you get when you cross an answering machine and the fat football player? What charges did the police bring against the baseball player? What's the quietest sport in the world? 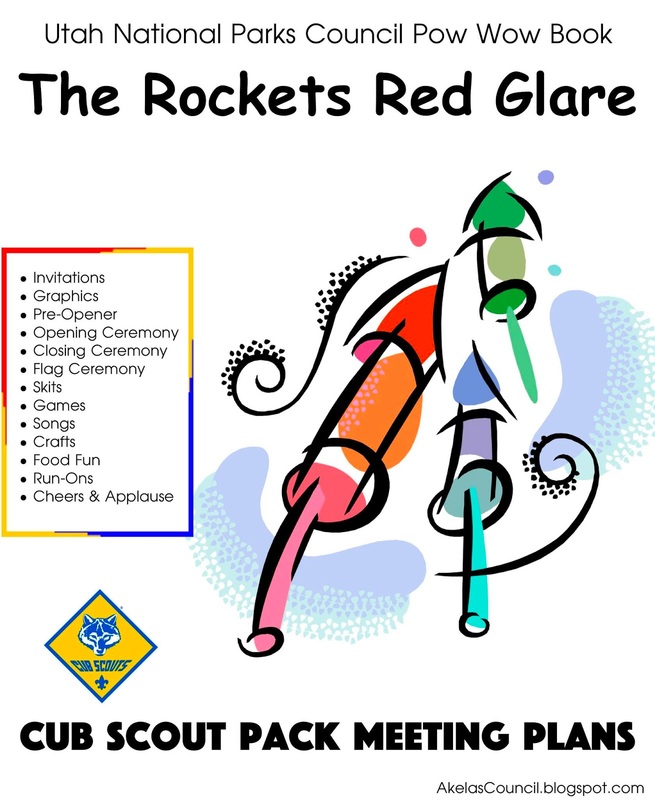 THE ROCKETS RED GLARE was the official Cub Scout theme in June 2007. 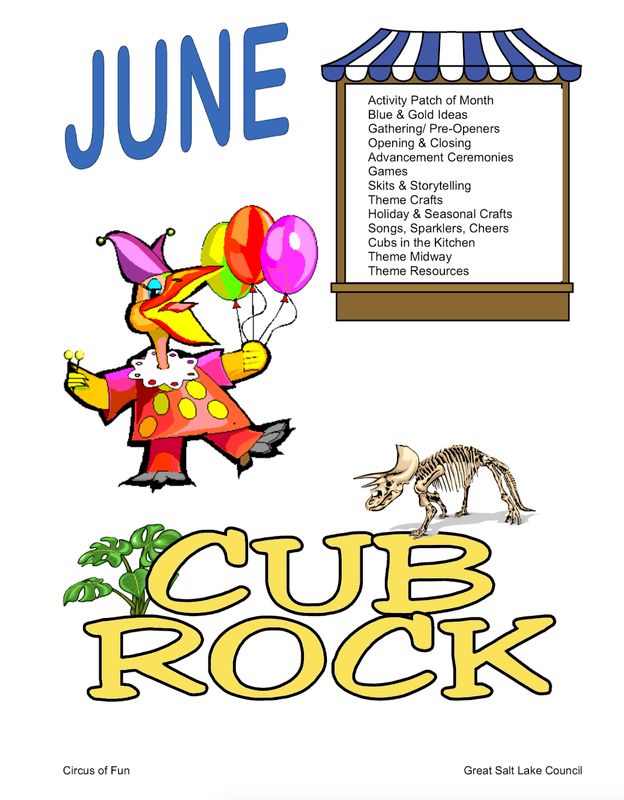 Here is a section from the 2006-07 Utah National Parks Council PowWow book. This is a great theme, and many of the ideas that were used back then can still be used today. 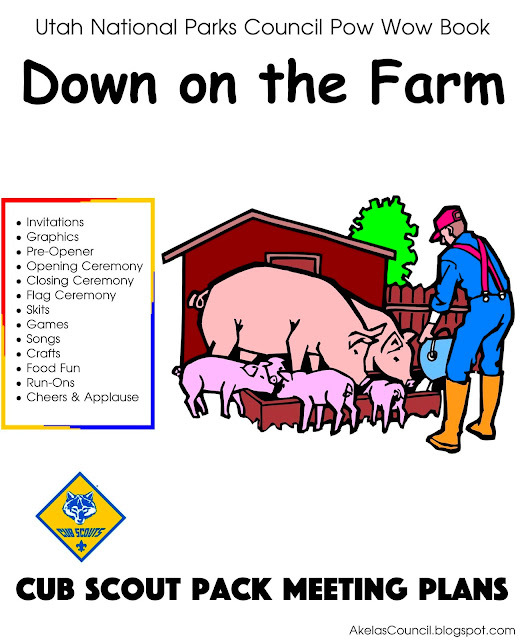 POLES APART was the official Cub Scout theme in January 2007. Here is a section from the 2006-07 Utah National Parks Council PowWow book. This is a great theme, and many of the ideas that were used back then can still be used today. 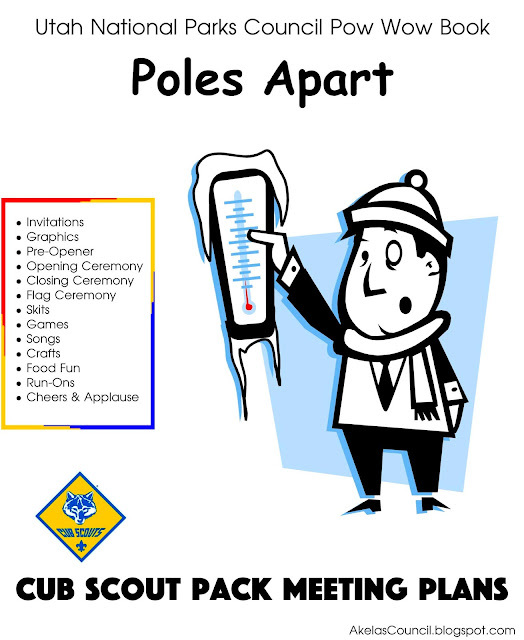 Pack Meeting - Don't let it pass you by... it's Poles Apart! What happened to the plant on the windowsill of the math room? Who can tell me the shape of the world? What kind of teachers do you find at the South Pole? DOWN ON THE FARM was the official Cub Scout theme in October 2007. Here is a section from the 2006-07 Utah National Parks Council PowWow book. This is a great theme, and many of the ideas that were used back then can still be used today. CUBS IN SHINING ARMOR was the official Cub Scout theme in November 2006. Here is a section from the 2006-07 Utah National Parks Council PowWow book. This is a great theme, and many of the ideas that were used back then can still be used today. 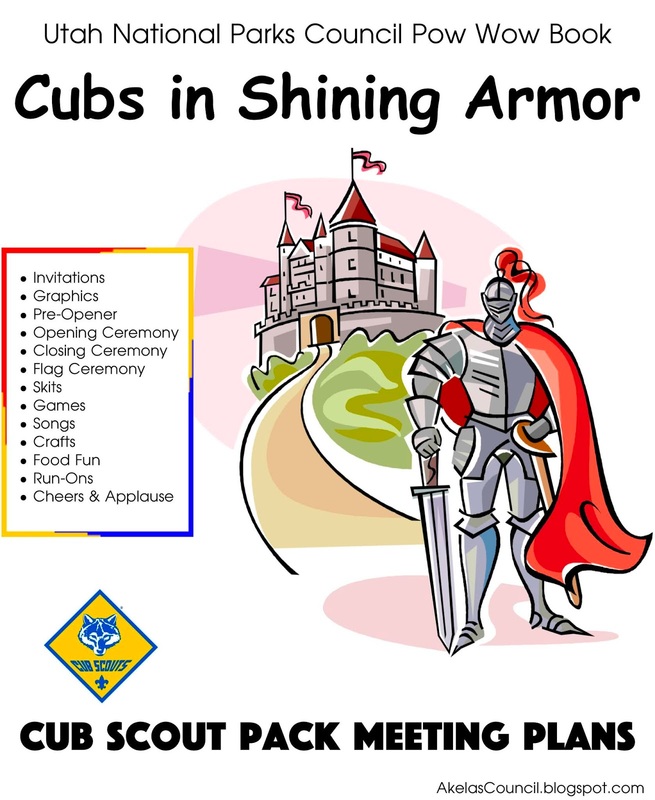 Don't forget to bring your KNIGHT to Pack Night! Where do knights go to grab a bite to eat? Why did every castle have a bank with an automatic teller? What did King Arthur listen to every evening at six? Why did Robin Hood rob only the rich? What do you call it when all the knights trade places at the round table? When a knight in armor was killed in battle, what sign did they but on his grave? What did the dragon say when he saw St. George?